With the right approach, a dental practice’s first day can be one to remember. ClearPath Society Member, Dr. Lauren Roper is a prime example. Yesterday, on her first day open, in her brand new start-up practice in Colorado, Lauren and her team fielded 21 phone calls. Day 2, more still! 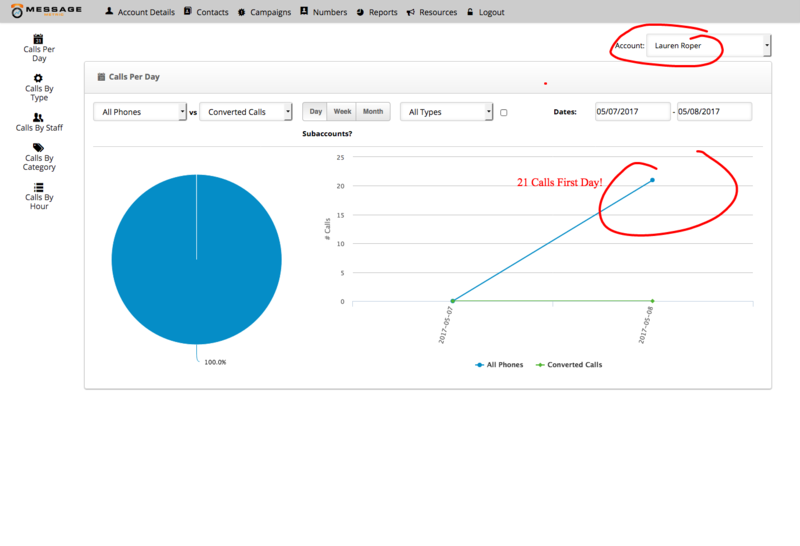 Here is a snapshot from our call tracking software showing the meteoric jump of new patient calls on Day 1. Amazing, eh? If you’d like to experience a bit of a surge like Dr. Roper, join us at our next New Patient Extravaganza. I’ll quote two great leaders, Booker T. Washington and Earl Nightingale. To put both in an advertising or marketing perspective, Mr. Washington is saying that to be successful all you have to do is find what’s been successful and follow the footprints of that success. Mr. Nightingale is saying that you can’t do what everyone else is doing around you. These two great statements seem in contradiction of one another, but they’re not. You have to find people who’ve been successful in an area that you too want to be successful – be it marketing, advertising, patient attraction, direct mail, membership programs, patient retention, higher re-care numbers, lower no-show rates, big and better case acceptance numbers – and follow them. Do what they’re doing. At the same time, you have to resist doing what the unsuccessful people are doing (which is a lot). Whew! What did I just say? You’re a product of the 5 people you surround yourself with. Find people who are successful in a way you want to be and don’t hang around with (or copy) people who are unsuccessful. If I told you that you could get the secrets to success (footprints) in very specific areas that contradicted what everyone else is doing, but works, would you be interested? I’m sure you’d be interested, but a bit distrustful. Understandable. There’s a lot of people hocking a lot of s _ _ _ (stuff) out there. I’m writing to tell you about just such and event. You can listen or not. Your choice! Anyhow, I wanted to let you know my friend Jerry Jones, founder of Jerry Jones Direct, creator of ClearPath Society, owner of Wellness Springs Dental (in Salem, Oregon) is hosting a 2-day event May 19 & 20. Yes, that’s two weeks from today. Jerry’s not a dentist, but he runs a very success dental office (In a town of 161,637 people, with 239 dental practitioners. That’s an average of 676 patients per doc. Not a financially healthy ration. I can tell you Jerry’s ratio is about 5 times that. He’s successful because he’s found (and forged) a lot of footprints that the majority of other docs aren’t doing (correctly). Jerry’s going to share a lot of his successful stuff. Jerry’s also asked me to be there and share. I’m going to share what I’ve learned and tested specifically in the areas of radio and television marketing and advertising. You may be asking yourself, what do I know about TV and radio… he’s just a video guy… he’s just a testimonial guy. You may not be aware, but I’ve done a lot on TV and radio. With my biggest client in the medical field, erectile dysfunction, I did all their radio and TV work, for 10 years. We generated 1200 patient leads a week, from print, Radio, and television, for 13 clinics. This is a 37 million dollar a year business. I haven’t shared any of what I did with that client because I couldn’t, until now. I’m going to share all the secrets we learned in leveraging our radio and TV advertising… and it’s all applicable to the independent dentists. After 10 years in this with one client, I will tell you it’s formulaic (footprints to follow). Also at the event is our friend Matt Prados, founder of Gotcha Local Marketing. Matt is the sharpest (and brightest) pencil in the box when it comes to all online marketing. So, here’s the deal. You’ll have access to the three top guys in dental marketing with respect to all things print, TV/Radio and online. First, this is a small event. Jerry only allows 10 practices at a time to attend. The New Patient Extravaganza in two weeks is already 2/3’s full. Only 3 chairs left. Second, it’s kept small for a reason. This is not like any other event you’ve attended. Most events are “learn and leave”, meaning you go, gather a bunch of information, leave and you’re on your own to implement the stuff when you get back to the office. Not this event. This is a “learn and do”. So here’s the format. On the first day Jerry, me and Matt are going to show you our best stuff (that’s the learningpart) and on the second day, you get to work on what you want to do based on what you learned the first day. So, from what we showed you on day 1 you get to pick and choose. You get to say, “Yep, that’s for me… I want to do that, that and that”. On day 2 you, and whoever you bring with you, Jerry, me and Matt work together to map out your implementation plan. When you get back to the office the only thing you need to do is “GO”. The plan will be mapped out before you leave. This is the proverbial Staples ‘EASY’ button. You know from experience, you’ve attended events and leave with good intentions for implementing what you learned, but you don’t. Why? Because life happens. The business happens. And it all gets in your way. That’s what mastermind groups are for. To get together with like-minded people and work on your business. This is not a mastermind group. This is a master implementation group. You will leave with a plan ready to implement. On day one the success footprints will be laid out your feet. You get to pick from successful dental marketing stuff like going through the food line at the local Golden Corral. You decide which paths you want to follow. On day two you do what no one else does, work on implementing before you leave. Every day you show patients what they need to do for their oral health. You develop a treatment plan customized for them. You present it to them. They agree with it. You send them on their way with it and what do they do? NOTHING!!! Doesn’t it just piss you off when that happens? I can speak for Jerry and Matt, but the same thing happens to us with clients too. And it frustrates us. That’s why Jerry created the ‘learn-and-do” format for these New Patient Extravaganzas. We’re taking every obstacle out of your way. Speaking of obstacles… it’s only two weeks away. That’s short notice. A heart attack is ‘short notice’. That can’t be your excuse. There are flights leaving every day from your city that will transport you to Salem, Oregon. If you’re in driving distance of Salem, there are big green signs over the road that will direct you there. I can guarantee you there are dentists in Salem (at least 238 of them) that will be aware of this event and WILL NOT ATTEND. In fact, I know there will be not one dentist from Salem attending, even with the ability to see what Jerry does to promote his own office! Obstacles are for mere mortals. You graduated dental school, for God’s sake. You opened a practice, you attract patients, you perform dentistry on them, you employ people, you run a business, you keep honest with the government and you manage to keep a roof over a lot of people’s heads. Getting to Salem in two weeks is not an obstacle. I’m sorry if that sounds a bit harsh, but geez… really? If a patient called your practice today with an emergency, what would you say? “We’ll see if we can fit you in.” The good docs I know would move heaven and earth for patients. Sorry! This is too important! I’ll give you an out. There’s another one of these in August, but do you want to wait that long? That’s another 11 weeks away. A lot can happen in 11 weeks. You can check out the New Patient Extravaganza at: jerryjonesdirect.com/new-patient-extravaganza. Use code: MAY at checkout to save $100.